The exuberantly curlicued flower stem from fall-planted hardneck garlic (the kind grown in Montana) is known as a garlic scape. Farmers remove each scape to encourage the growth of large and plump bulbs of garlic underground. For years garlic scapes remained underappreciated. So underappreciated, that they usually ended up tossed into compost piles. Over the past half-a-dozen or more years, garlic scapes have been “discovered.” Unless you grow your own hardneck garlic, garlic scapes remain difficult to find outside of farmers’ markets. 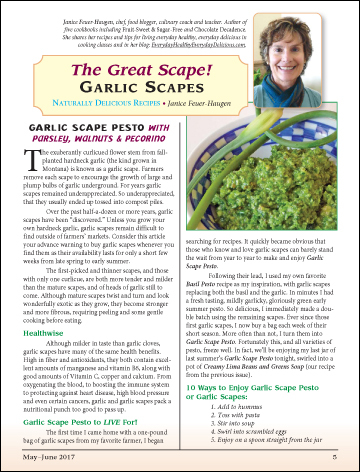 Consider this article your advance warning to buy garlic scapes whenever you find them as their availability lasts for only a short few weeks from late spring to early summer.